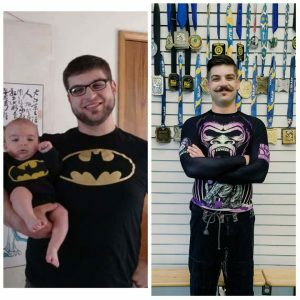 November 2016 – Student feature of the month – Wes Hartlieb 289lbs before Jiu-Jitsu, now at 205 lbs. Wes trains regularly and actively competes at ASBJJF and IBJJF tournaments. This article was posted on Sunday, November 6th, 2016 at 1:14 pm	and is filed under BJJ. You can skip to the end and leave a response. Pinging is currently not allowed.